Edward Hartley, U.S. orthodontist, 1855-1930. See: Angle classification of malocclusion. The meeting point of two lines or planes; the figure formed by the junction of two lines or planes; the space bounded on two sides by converging lines or planes. For angles not listed below, see the descriptive term; for example, axioincisal, distobuccal, labiogingival, linguogingival (2), mesiogingival, and proximobuccal. 1. the point at which two intersecting borders or surfaces converge. Scapula, showing the lateral, superior, and inferior angles. 2. the degree of divergence of two intersecting lines or planes. acromial angle the subcutaneous bony point at which the lateral border becomes continuous with the spine of the scapula. axial angle any line angle parallel with the long axis of a tooth. cardiodiaphragmatic angle that formed by the junction of the shadows of the heart and diaphragm in posteroanterior radiographs of the chest. costovertebral angle that formed on either side of the vertebral column between the last rib and the lumbar vertebrae. filtration angle a narrow recess between the sclerocorneal junction and the attached margin of the iris, at the periphery of the anterior chamber of the eye; it is the principal exit site for the aqueous fluid. iridial angle , iridocorneal angle, angle of iris filtration a.
line angle an angle formed by the junction of two planes; in dentistry, the junction of two surfaces of a tooth or of two walls of a tooth cavity. Louis' angle , Ludwig's angle sternal a.
point angle one formed by the junction of three planes; in dentistry, the junction of three surfaces of a tooth, or of three walls of a tooth cavity. angle of pubis subpubic a.
sternal angle the angle between the sternum and manubrium. subpubic angle that formed by the conjoined rami of the ischial and pubic bones. tooth angles those formed by two or more tooth surfaces. venous angle the angle formed by junction of the internal jugular and subclavian veins. visual angle the angle formed between two lines extending from the nodal point of the eye to the extremities of the object seen. Y angle that between the radius fixus and the line joining the lambda and inion. 1 the space or the shape formed at the intersection of two lines, planes, or borders. The divergence of the lines, planes, or borders may be measured in degrees of a circle. 2 (in anatomy and physiology) the geometric relationships between the surfaces of body structures and the positions affected by movement. The figure formed by the junction of two lines or planes; the space bounded on two sides by lines or planes that meet. For specific angles, see the descriptive term, e.g., axioincisal, distobuccal, labiogingival, linguogingival (2), mesiogingival, proximobuccal. n the divergence of two lines or planes from a common point of origin. n the point on the lateral surface of the sacrum as it curves toward the middle of the fifth sacral vertebra. 1. The figure formed by two intersecting lines or planes at one point. 2. The direction from which an object is viewed. 3. The form produced by a change in direction of a line or plane. angle alpha Angle between the visual axis and the optical axis formed at the first nodal point of the eye. The visual axis usually lies nasal to the optical axis on the plane of the cornea (positive angle alpha). It is, on average, equal to about 5º in the adult eye. If it lies temporal to the optical axis, the angle is denoted negative (Fig. A9). Symbol: α. See angle lambda. angle of altitude 1. The angle through which the eyes have turned up or down from the primary position by a rotation about the transverse axis (x-axis). 2. The angle between the plane of regard and the subjective horizontal plane. Syn. angle of elevation. angle of anomaly Angle between the line of visual direction of the fovea and the line of visual direction of the abnormal corresponding point of the same deviated eye. It is usually represented by the difference between the objective and subjective angles of deviation in abnormal retinal correspondence. See line of direction; abnormal retinal correspondence. angle of the anterior chamber Angle at the periphery of the anterior chamber formed by the root of the iris, the front surface of the ciliary body and the trabecular meshwork. Syn. angle of filtration; drainage angle; irido-corneal angle. See gonioscope; Shaffer and Schwartz van Herick method; Smith's method; shadow test. apical angle See prism angle. 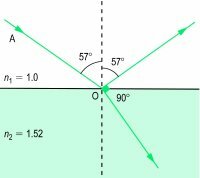 angle of azimuth The angle through which the eyes have turned right or left from the primary position by a rotation about the vertical axis. Brewster's angle See angle of polarization. contact angle Angle formed by a surface and a tangent to a sessile drop of fluid (usually water) at the point where the drop meets the surface. This angle indicates the degree of wettability of that surface. The more wettable (or hydrophilic) the material, the smaller the angle, being equal to 0º for a completely hydrophilic material when water spreads evenly over that surface. Hydrophobic surfaces can have contact angles greater than 90º, e.g. silicone rubber in which the angle is about 120º (Fig. A10). Syn. wetting angle. See sessile drop test. where d is the distance between the target and the midpoint of the base line and PD the interpupillary distance. Syn. angle of triangulation. See metre angle; prism dioptre; line of sight. where n and n' are the indices of the media on each side of the surface, with the light travelling from the high index medium n to the low index medium n′ (Fig. A11). Syn. limiting angle. See fibre optics; reflecting prism; total reflection; refractometer. angle of deviation 1. Angle through which a ray of light is deviated on reflection by a mirror, or refraction by a lens or prism. 2. Angle between the visual axis (or line of sight) of the deviated eye in strabismus and the straight-ahead position while the other eye fixates straight ahead. It can be assessed subjectively by having the patient report simultaneous perception (e.g. the lion in the cage seen in the amblyoscope) or objectively as measured by the practitioner either with the amblyoscope or using prisms and cover test, or by the Hirschberg test. Syn. angle of squint; angle of strabismus. See angle of anomaly; incomitance; Hirschberg's method; Javal's method; Krimsky's method; minimum deviation of a prism. angle of divergence Angle between the lines of sight of the two eyes which are in a state of divergence. drainage angle See angle of the anterior chamber. angle of elevation See angle of altitude. angle eta See stereoscopic visual acuity. angle of filtration See angle of the anterior chamber. angle gamma The angle between the optical axis and the fixation axis. 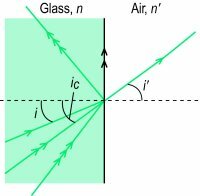 angle of incidence Angle between the incident ray and the normal to the surface at the point of incidence in either reflection or refraction at a surface separating two media. irido-corneal angle See angle of the anterior chamber. angle kappa Angle between the pupillary axis and the visual axis, measured at the nodal point. Symbol: κ. See angle lambda; line of sight. angle lambda Angle between the pupillary axis and the line of sight formed at the centre of the entrance pupil. It is this angle which is measured clinically as it is almost equal to angle alpha. Symbol: λ. See pupillary axis; line of sight. limiting angle See critical angle. metre angle (ma) Unit of convergence which is equal to the reciprocal of the distance (in metres) between the point of fixation assumed to lie on the median line and the base line of the eyes. Thus, if an object is located at 25 cm from the base line, each eye converges through 4 ma; at 1 metre, 1 ma, etc. Metre angles of convergence can be converted into prism dioptres of convergence by multiplying by the subject's interpupillary distance expressed in cm. Example: for a PD of 6.0 cm, a convergence of 5 ma = 30 Χ. See angle of convergence. minimum angle of resolution (MAR) The angle subtended at the nodal point of the eye (or the centre of the entrance pupil) by two points or two lines which can just be distinguished as separate. See visual acuity; log MAR chart. 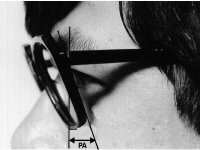 pantoscopic angle Angle between the spectacle plane and the frontal plane of the face when the superior edge of the lens is farther away from the face than the inferior edge (Fig. A12). Syn. pantoscopic tilt. See retroscopic angle. and measures 56.7º when the first medium n1 is air and the second medium n2 is a glass with an index of refraction equal to 1.523. Syn. Brewster's angle. See polarized light. prism angle The angle between the two refracting surfaces of a prism. Syn. apical angle; refracting angle (this term is deprecated because of the confusion with 'angle of refraction'). recession angle A tear between the longitudinal and circular muscles of the ciliary body. It is most often noted following blunt trauma to the anterior segment. It is typically followed by hyphaemia. This form of injury predisposes the individual to elevated intraocular pressure (i.e. increased risk of glaucoma) in the future. With a gonioscope, angle recession appears with an abnormally wide ciliary body band with a prominent scleral spur and some torn iris processes. There are also marked variations in the width and depth of the angle in different quadrants of the eye. See cyclodialysis; hyphaemia; iridodialysis; ciliary muscle. angle of reflection Angle between the reflected ray and the normal to the surface at the point of incidence. angle of refraction Angle between the refracted ray and the normal to the surface at the point of emergence. retroscopic angle Angle between the spectacle plane and the frontal plane of the face when the superior edge of the lens is closer to the face than the inferior edge. Syn. retroscopic tilt. See pantoscopic angle; frontal plane; spectacle plane. angle of squint See angle of deviation. angle of stereopsis The difference between the angles subtended at the centres of the entrance pupils of the two eyes by two points located in space at different distances from the eyes. See stereoscopic visual acuity; Howard-Dolman test; three-needle test. angle of strabismus See angle of deviation.total a. of convergence See angle of convergence. angle of triangulation See angle of convergence. viewing angle See visual angle. visual angle The angle subtended by the extremities of an object at the anterior nodal point of the eye. If the object is far away, the point of reference can be the centre of the entrance pupil or even the anterior pole of the cornea. Syn. viewing angle. wetting angle See contact angle. refracting angle See angle, prism. Meeting point of two lines or planes; figure formed by the junction of two lines or planes; space bounded on two sides by converging lines or planes. n the degree of divergence of two or more lines or planes that meet each other; the space between such lines. Measured in degrees of an arc. n a hoe-shaped, paired cutting instrument; biangled with the blade parallel with the axis of the shaft. The cutting edge is not perpendicular to the axis of the blade. Used to accentuate angles in an “invisible” class 3 cavity. n the angle formed by the sagittal plane and the path of the advancing condyle during lateral mandibular movement, as viewed in the horizontal plane. n a device used to facilitate the establishment of reproducible angular relationships between a patient's head, the radiographic beam, and the radiograph film. n the angle in a prepared cavity, formed by the junction of the wall of the cavity with the surface of the tooth. n the angle at which a liquid or vapor meets a solid surface; e.g., the angle at which a droplet of water rests on an oily surface. n the angle formed by a line representing the floor of the anterior cranial fossa intersecting a line representing the axis of the clivus of the base of the skull. n 1. the angle made by the slopes of a cusp with the plane that passes through the tip of the cusp and is perpendicular to a line bisecting the cusp; measured mesiodistally or buccolingually. 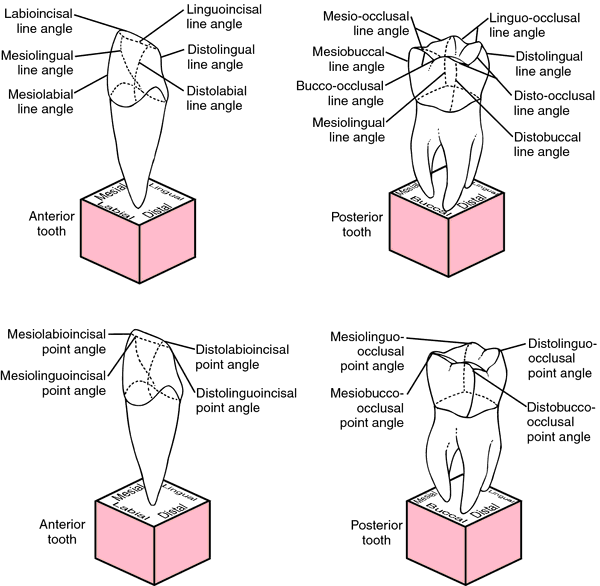 Half of the included angle between the buccolingual or mesiodistal cusp inclines. n 2. the angle made by the slopes of a cusp with a perpendicular line bisecting the cusp; measured mesiodistally or buccolingually. n an anthropometric expression of the degree of protrusion of the lower face, assessed by measuring the inclination of the facial plane relative to a horizontal reference plane. n a paired, hoe-shaped cutting instrument that has the cutting edge at an angle other than a right angle in relation to the axis of the blade. n a measure of the mandibular incisor to the Frankfort horizontal plane. n the degree of slope between the axis-orbital plane and the palatal discluding skidway of the maxillary incisor. n the angle formed with the occlusal plane by drawing a line in the sagittal plane between the incisal edges of the maxillary and mandibular central incisors when the teeth are in centric occlusion. n the inclination of the incisal guide on the articulator. n the inclination of the incisal guide in the frontal plane. n an angle formed by the junction of the two walls along a line; designated by combining the names of the walls forming the angle. n the angle formed by the occlusal rest with the upright minor connector. n an angle at the intersection of the posterior and inferior borders of the ramus. n an angle formed by the junction of three walls at a common point; designated by combining the names of the walls forming the angle. n the inclination of the incisal guide in the sagittal plane. n See angle, occlusal rest. n the angle of the chin, which may be protruding straight or receding, according to type.